2017 marks the 18th Annual Keyboard Wellness Seminar founded and presented by pianist and renowned pedagogue Sheila Paige. Ms. Paige has over 35 years of experience in the Taubman Approach and an extensive background in Alexander Technique. In 1995, Sheila Paige began presenting workshops on the Taubman Approach; over the years demand for her workshops and private lessons grew. In 2000, Ms. Paige realized her dream of organizing an annual seminar based on a multi-disciplined approach to learning and began the Piano Wellness Seminar. It became the Keyboard Wellness Seminar in 2009 with the addition of organ, and now computer use is also included. What sets this seminar apart and makes it unique from other conferences and festivals is the inclusion of many supportive and synergistic disciplines. Better use of the body helps all pianists to play with more ease, gain a better technique, and achieve the goal for which all musicians strive: a technique so comfortable that it leaves the performer free to think only about the music. Sessions given by Ms.Paige include her innovative strategies that go far beyond the Taubman Approach. These sessions are complemented by Phyllis Richmond, MSTAT. But because the body is connected to the mind and the emotions, or, if you will, the spirit, these areas are also explored. Vicki Conway presents two very important topics: Fine Tune Your Ears and Developmental Fitness. In “Fine Tune Your Ears”, you will learn the critical role that the inner ears play in both listening and balance. As sound travels through the inner ear, higher frequencies are processed through the cochlea, ‘the listening ear’, while lower frequencies are processed through the vestibular system, ‘the ear of the body’ that makes us move to the beat. The vestibular ear of the body also controls our balance, and guides our sensory-motor integration including eyes, ears, and coordination for both gross and fine motor skills. You will learn how to fine-tune the ears to enhance learning and improve focusing, reading, listening, and performing skills. Developmental Fitness is a performance enhancement and stress reduction program based upon the principle of neural plasticity. Our early childhood experiences, along with thirteen developmental skills, establish the neural wiring patterns upon which we base all future learning. However, these patterns can be modified and improved upon throughout life. Using integrative movements and simple manipulatives, this program makes the entire body the instrument of learning. If you know how your brain, body, and emotions are interrelated, you can rapidly improve your rate of learning while reducing stress and anxiety. Participants have access to a week of biofeedback training, presented by Robert Bonham. The training uses HeartMath technology to demonstrate the intimate connection between feelings and the physical heart and brain. FreezeFrame then teaches techniques to stay in the zone and reduce performance anxiety. We also have sessions on Reflexology, Nutrition, T’ai Chi, Peaceful Warrior Workout, Reiki, and Tune-up Tips to Optimize Your Day. Disciplines in other years have included Bodymapping, Egoscue Method, Massage Therapy, Meditation, iPad for Pianists, Memorization and Pilates. Of course, there are also master classes, private lessons with an experienced faculty, concerts, and the energy, camaraderie, and support that one expects to experience at piano festivals. 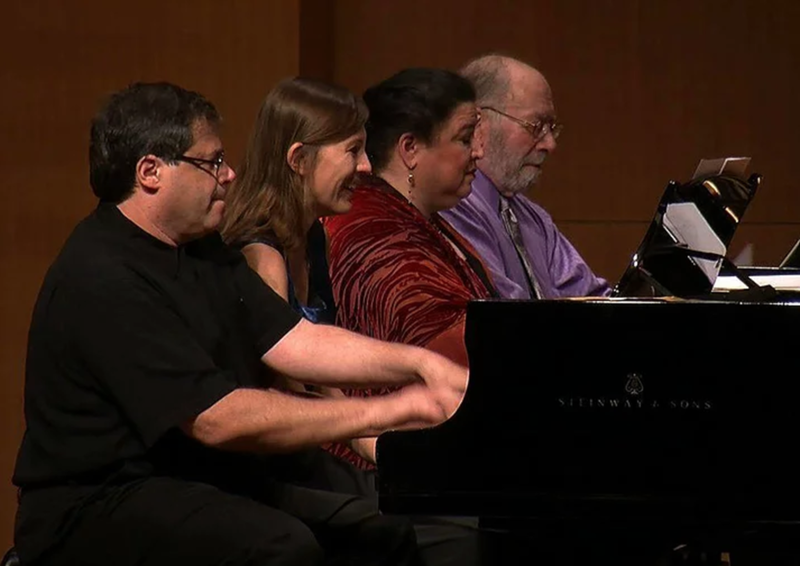 Sheila Paige and the Keyboard Wellness Seminar faculty are dedicated to helping today’s pianists “create a wellness legacy for the future.” Join us for a week of playing, learning, performing, inspiration, and excitement!